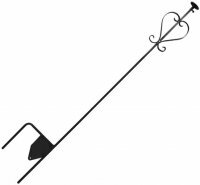 Made with 7/16" square steel bar, this wrought iron bird house staff comes in one section. The 12" step-in blade provides extreme stability even in soft soil. Size: 60" overall height. 48" tall once installed. Fully Powder coated with a baked on automotive grade finish. Decorative scrolls. Our Wolf Point Forge Label with screw pack is attached. The mounting plate is 3" in diameter. USA made with all American sourced material. EBL6 - Black S-Hook - 6"